The world of international affairs is often seen as a shadowy one, full of intrigue, cloak-and-dagger, and posturing. Perhaps this is not far from the truth. One thing is certain: the larger the country, the more personnel is needed to staff the countless embassies, consulates, and other outposts who represent their country. A student of my wife's and mine recently gave an excellent report on American diplomacy and enlightened us on many aspects of this complex realm. The United States, at any given time, has approximately 15,000 personnel employed by the Department of State around the world, including at its 250 embassies. Of the 15,000 to 25,000 who go through the battery of tests and applications for foreign service positions, only about 3%-5% make it all the way through to a salaried post. "...the real crucial link in the international exchange is the last three feet, which is bridged by personal contact -- one person talking to another." And so it has always been, and so it will always be. - The color originally associated with Patrick was "St. Patrick's blue," not green.- The first St. Patrick's Day parade was not in Ireland, but in the American colonies, when the Irish who were fighting in the British army marched through the streets of New York City in 1762. - The Irish haven't always been so popular -- in the years following that first parade, St. Patrick's Day in the US was mostly about unity and strength among persecuted Irish-American immigrants. The party didn't go global until 1995, when the Irish government started touting St. Patrick's Day as a way of advertising the beauty of the Emerald Isle to the rest of the world. - Only recently has the general public started once again paying more attention to the actual Patrick, the man, the missionary, the hero. Happy St. Patrick's, wherever you are! I'm in the process of finishing up a brand new online mini-course to help people who are wanting to, about to, or have to study a foreign language. And I have new fodder: I've just undertaken Arabic, using video tutorials and weekly Skype sessions with a Syrian friend in Germany whom Becky and I met last summer when we were there. The truth is, learning a foreign language is not a super power. Hard work, yes. But all my years of speaking and teaching languages have given me many insights into how people learn languages -- but also some fundamental elements that are missing in a lot of language methods. Hence this mini-course. If you're considering starting a foreign language, or have already started but find yourself a wee bit discouraged, this is for you. Just leave your email address in the form below and you'll be on your way to a more successful adventure in learning to speak another language. And believe me, there is nothing more gratifying than another person understanding you when you get up the nerve to practice your new words! Many years ago in Switzerland I had a voice student named Catherine. Catherine taught me something I've never forgotten, although it will take me a lifetime to fully put it into practice. A little background: as you may know, Switzerland is composed of three main regions. By far the largest is the German-speaking area in the north, center, and east. There is a small Italian-speaking region bordering Italy in the south, and the French-speaking region, where I lived for a total of six years, in the southwest. Catherine is a French speaker, born and raised in the Lausanne area. So what is the lesson she taught me? At some point she realized she harbored some of the bias against German speakers common among her fellow French speakers. She then did something crazy -- she looked for and found a job in Zurich, the largest city in Switzerland, and moved there for a full year just to get to know some German-speaking Swiss personally as well as learn their language. She turned around and looked her prejudice in the face. And of course Catherine came home having made some dear friends and with a genuine appreciation for these people who, after all, are her compatriots. All because she did the difficult work of facing herself. And once she had identified the problem, she took tangible steps to do something about it. This continues to challenge me. You may think I'm bias-free because of what I preach. The truth is that we all have biases, and there is never a lack of work to be done in overcoming them. So with an occasional "ouch," I often think of Catherine. I'm not sure she learned all that much from me in the area of singing, but I certainly learned a life-long lesson from her. Any of this ring true for you? I was going through the archives of my first blog (back in the Blogspot days) and came across this post. I'm taking the liberty to repost it because, as is often the case, things that were written years ago can sometimes have just as much if not more relevance in the moment. I'll let you decide: A recent article in The Economist struck a chord that was already resounding more and more loudly. I read The Economist for a number of reasons: being a British publication, it gives the badly needed perspective of an outside observer on US issues. Its global scope also covers international issues many American periodicals ignore. The writer (anonymous, an Economist trademark), put his or her finger on yet another paradox of life in these United States. Lexington, as said writer is called, has lived in a number of world capitals, including London, Beijing, Brussels, and Washington, DC. Only in Washington, however was the newly arrived Lexington met with such friendly neighbors as to offer home-cooked food and invitations to backyard softball. Such civility is actually documented by the OECD (Organization for Economic and Cooperative Development), which states that "Americans are far likelier than its average citizen to have helped a stranger in the previous month...and twice as generous when volunteering their time." The paradox is that such a civil country is engaging in more and more UNcivil politics. Lexington observes that, although both presidential candidates talk a lot about the future, their campaigns are actually nostalgic attempts to recover the mythical power of the American dream. What the two campaigns have in common -- and the camps they represent -- is that each side blames the other for the economic woes of our time. "Seeking to blame each other for economic shifts that are bigger than either party," Democrats and Republicans openly accuse each other of sabotaging the American ethos. It has suddenly become more about being on the right side than being an American. Period. This polarization can have devastating consequences over the long term. As partisans become increasingly inflamed by the righteousness of their relatively short-term cause, each election leaves the nation licking its progressively deeper, self-inflicted wounds. The result: a weak and introverted society incapable of confronting the challenges of being a world leader with any sort of united front. As Lexington remarks, American "trust and generosity cannot forever survive a widespread sense that they are being abused." My wife and I took a brief road trip last weekend. I like road trips except for one thing: I get so sleepy behind the wheel. Enter the audio book. This time we chose a book that had been mentioned by a good friend. Don't Let's Go to the Dogs Tonight takes place in Southern Rhodesia during the time the nation becomes Zimbabwe. Since Becky and I spent two months in Zimbabwe just five years after the war of independence, we were immediately taken back to those life-shaping experiences as we listened. This enabled us to stick with what others might find a bit of a sleepy read. Author Alexandra Fuller recounts with an incisive style a childhood reminiscent of the American West, where tough, white pioneers make a life for themselves amid punishing conditions in a tumultuous time and no shortage of adversaries. Hers wasn't an easy childhood. But one thing jumped out at both Becky and me at the same time: when Alexandra left Africa for England for the first time, she realized there were certain things she couldn't know about Zimbabwe until she left. So true. There are things you can't know about your home country until you leave it. You can't know there is more than one way to do things, like flush a toilet. Or dry your clothes. You can't know everyone doesn't have a choice of 78 breakfast cereals at the supermarket. You can't know that you live in a country where way too much is taken for granted, as if we deserved everything we have. Then you come back and everything is the same -- except the way you see it. I was at a symposium last night on Russian-American relations moving from the Obama years into the Trump era. While most of Dr. Mark Katz's remarks and the questions asked of him centered on Trump and Putin's relationship and speculation about what that might look like moving forward, one question was asked that got me thinking about stereotypes. The question was something to the effect of, "How fair is it for Americans and other Westerners to believe that Putin's strong man persona is representative of the Russian people and culture?" The question put its finger on a common and universal tendency: to assume that everyone in a given group or culture is the same. We would of course deny that we think in such base and ignorant terms, but most of us are guilty of this at one time or another. In the case of Vladimir Putin, we might think that most all Russians only understand the language of power and force, as Putin's MO is widely believed to be. And it is true that there are many Russians who are glad to have a leader who stands up to the West and is committed to restoring Mother Russia to her former glory. But there are probably just as many Russians who would like a "kinder and gentler" leader who doesn't enjoy provoking the West and suppressing dissent. The few Russians I know personally are kind, caring people who have mixed feelings about their president -- like most of the world feels about its leaders. Some will point out that Putin is a vast improvement over his predecessor, Boris Yeltsin. We could think of other examples of stereotypes. Are all Germans super organized and efficient, with a hard exterior? Nope. Are all Japanese workaholics? Nope. Not quite! Are all Australians laid back? I don't think so, but I'm still looking for an uptight Aussie. Aha. So here we see that there is often a kernel of truth to certain stereotypes. There is usually a reason why they were formed in the first place. The truth is that stereotypes can at times be useful, up to a point. If I were putting together an international team, I wouldn't be wrong to go to Switzerland or Germany to look for an administrative type, for example. International marketing firms will tell you that stereotypes based on studies and market research prove invaluable in their marketing strategies. But stereotypes can just as often get us into trouble. Chances are, as soon as we allow the stereotype to take shape in our minds, one or more exceptions will present themselves. In the current dialogue in the US about race, this is particularly dicey. It's a little too easy to assume all members of a certain race feel or behave the same way (racial profiling comes to mind). Polls and surveys and market research may help, but true understanding won't come until we sit down and listen to each other. I'm going to have just such an opportunity on Jan 27, when I have been invited to moderate a round table discussion on the current state of race relations in the US, including in the American church. If you're in the Nashville area, we'd love for you to join us. Details here. Happening onto a painting at the Musée d'Orsay that touches something buried deep inside you and leaves you filled and wanting more at the same time. Wandering the streets of a medieval Italian town and stumbling across a secluded garden that feels like it was reserved for you. Coming across a serene, blue glacier in the most utter silence you've ever heard, with not another soul in sight. 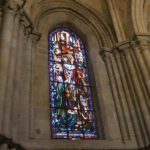 Sitting surrounded by the world's most beautiful stained glass and wishing you could know the king who commissioned it as an act of worship. Sitting at a table with new friends and wondering how you could possibly have been there for three hours. Climbing an extinct volcano in New Zealand and appreciating the challenge of the climb as much as the vistas from the summit. A conversation with a stranger whose kindness cuts through the outer crust of your heart. You come to find out that part of his name means "peace". Marveling at the mysteries of a lost civilization that left behind the glorious ruins where you now stand. Being invited to share the meager rations of a refugee family who has lost everything, destroying and rebuilding your notions of hospitality and humility. All of these, which I have experienced first hand, make the term "sightseeing" sound so mundane, so small. When you step outside to experience something or some place new -- even if it is one of the most touristy spots on the planet -- there are surely divinely orchestrated moments waiting for you. Especially if you're open to them. They can be little serendipities, or they can be moments of transcendence that alter your understanding of God. We're planning a framework for late spring where such moments are sure to find you. All you have to do is show up. We are all born curious. Show me a baby who isn't drawn to shiny objects or who doesn't believe everything is intended to be put in the mouth. Then the baby becomes a toddler and all of a sudden the entire house has to be childproofed. Everything at eye level is fair game to be explored and often dismantled. As a young child, I was a voracious reader. We were living in Australia, where, at least at the time, there was no kindergarten like we have in the US, and children started right into Grade 1 at the age of five. I was already reading when I started school in Perth, and I remember my teachers scrambling to keep me stocked with books. Seems I couldn't get enough. As I've written and spoken about before, we moved back to the US halfway through my fourth grade year, and on the return trip my senses were assaulted by the sights and sounds of exotic lands and foreign tongues. Once again, I couldn't get enough. The thing is, I don't know what. Somewhere along the line -- perhaps it was puberty -- I lost my love of reading and the curiosity behind that love. Up to that point I remember loving to read about all kinds of things -- I was simply interested in the world and everything in it. By my high school years my interests had narrowed to two main areas: music and foreign languages. I excelled in all my subjects, but some of them didn't require that much effort. I was indeed hungry to make progress in my two chosen areas, but I don't remember deriving much satisfaction from anything else. I'm sorry to say my college years were not much different. Music and foreign languages still dominated my brain space (foreign language eventually gained the upper hand) -- along with an overactive social life. I was well into my years living in Europe that I began to really notice things. To pay attention to a broader array of areas, such as world events and how they affect each other. Or how math and science cannot be entirely separated from, say, music or philosophy, or even theology. In fact, this growing sense that all things are somehow connected has become a driving force in (re)shaping my world view. And my fascination with how other cultures live and think plays right into this. In this season of my life, I consider it not only an important aspect of my life, but a calling, to somehow create sparks that trigger curiosity in others -- especially curiosity about people from cultures or experiences unlike ours. Regardless of your political persuasion or the outcome of the 2016 US elections, we all must admit that, now, more than ever, we are in great need of regaining and fostering cultural curiosity. Just as I allowed my mind to become dulled by who knows what -- teenage preoccupations, then too many college friends (yes, I think that's possible), we can as adults allow ourselves to be lulled to sleep by the familiar. Falling asleep in our own echo chamber. Is it possible to make someone curious? Perhaps, perhaps not. But just as a parent provides toys, activities and games that appeal to the innate curiosity of a child, we can most certainly make things available to whet the imagination of those who are asleep...while continually feeding the imagination of those who are curious. Season 2 of the World to the Wise podcast aims to do just that. Stay tuned! If you're already a subscriber, we would appreciate your taking a minute to write a brief review. What adventures has your curiosity led you to? Last summer we were forever changed. As the European refugee crisis began to gain more and more international attention, we began to realize how little we really knew about the complexities of the situation. We decided we needed to understand better, and up close. Having very little idea what to expect, we signed up to meet up with a team from Servant Group International to work with refugees in Athens. “Work” is a relatively loose term here – if we did any work, it was nothing more than helping with some meal preparation and giving some English lessons. What we mostly did was observe and learn from the Syrian, Palestinian, Iraqi and Afghani refugees we encountered. Some we met at the tent camps at the port of Pyraeus. Others we met at the “squats” – abandoned buildings such as schools, where they had set up tents in the classrooms. We heard stories of heart-wrenching trauma. We talked to people who were successful, upstanding citizens in their home country before they were forced to flee and leave everything behind. We listened on the verge of tears to accounts of the harrowing, multi-leg journey to where we now sat together. And more than once we were on the receiving end of hospitality that put us to shame. We quickly learned that many of the refugees we befriended had loves ones waiting for them in Germany, so we decided to follow two or three of the stories and look up some of these loved ones in Berlin. We were mostly successful, and gratified and saddened at the same time to witness the separation first-hand. 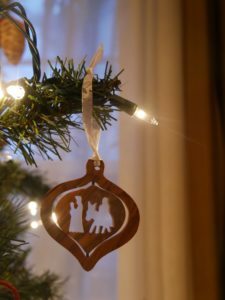 The love of God become incarnate in Jesus, who along with his parents, began his life as a refugee. It reminded us that for all our efforts to understand the plight of the displaced, no one identifies more with them – or with any of us – than He. And we will never be the same. You see, Christmas is about way more than Jesus OR Santa; it’s a time to feel all warm and cozy and watch schmaltzy movies and treat each other nicer than usual. We call that the Spirit of Christmas. We give each other presents — so many that Christmas shopping counts for 20% of American retailers’ annual profits. And giving to non-profits for one last tax deduction is part of that spirit, I suppose. And of COURSE there’s food. Lots of it, especially sweets. Not sure how baby Jesus feels about the amount of weight gained in this country at this time of year. But who doesn’t love a slice of pumpkin pie or peppermint bark or bourbon bonbons or fudge or…I could go on. And somewhere, some time, someone decided that if two people were found standing together under some mistletoe, a parasite that grows on trees, they have to kiss each other. But you never hear mention of mistletoe at another time of year, so I’m not sure it counts if you’re looking to kiss someone. “Uh, no idea. In fact, the tree thing probably dates back to the pagans as well, but oh, we love our Christmas trees. In fact, most of us love pretty much all of it. 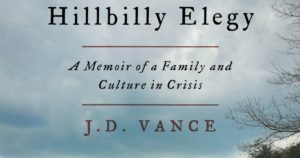 In my last post, I mentioned being impacted by J. D. Vance's powerful and tragic book, Hillbilly Elegy: A Memoir of a Family and Culture in Crisis. My wife and I actually read it together -- sort of. I read aloud to her while she crocheted -- a favorite pastime of ours. Although Vance calls the book a memoir, he admits from the start that he's not old enough to call anything he writes by that name. The term 'elegy', a song of lament or mourning, was a harbinger of the emotion I was left with after reading the book. Vance, a Yale Law School graduate now practicing in Cincinnati, seems ambivalent throughout the book toward the subculture in which he grew up in Eastern Kentucky and Western Ohio. On the one hand, he is not afraid to call out the tragic flaws and shortcomings of what he unabashedly calls hillbilly culture; on the other, he is not ashamed to identify with them still today, using the pronoun "we" when referring to them, even though he himself has risen out of the struggling socioeconomic conditions he came up through. The childhood Vance describes growing up in Kentucky does nothing to debunk the stereotypes most people have about Appalachia: much of it sounded like it could have been lifted right out of the Hatfields and McCoys. The towering figure in his life was his maternal grandmother, Mamaw, who was largely responsible for raising him in the frequent absence of his drug-addicted mother. The young J.D. lived in a constant state of instability, unsure when his mother would freak out, divorce her current husband and marry another, or come back begging for forgiveness -- or money. When J.D. was a young teenager, he moved with his mother, sister, and grandparents to Middletown, Ohio, where it turns out thousands of other Eastern Kentuckians have ended up since the Appalachian coal mines began their demise. Even though Middletown was a larger town than his native Jackson, KY, there were so many transplanted Kentucky hillbillies and working class folks that his world view was hardly challenged. Because of all the unrest at home, J. D. almost flunked out of high school, but he somehow managed to graduate and, deciding he wasn't yet ready for college, enlisted in the Marines. According to Vance himself, the Marines were the best thing that ever happened to him. He credits his two years with them with much of his later success, not to mention self-esteem and a host of other qualities. But the highest praise goes to Mamaw, his foul-mouthed, church-going, rough-and-tumble grandmother who never ceased to remind him that he could do and be whatever he wanted to, as long as he worked hard (a creed she apparently found easier to preach than practice). The fact that J. D. Vance was able to graduate from college, let alone attend and succeed at one of the most prestigious law schools in the world, is nothing short of miraculous, given the many factors working against him. That story in itself would make for compelling reading. But his vivid and at times painful depiction of his family's dynamics and the culture they hailed from is an important window into a pretty broad swath of the American population. He places the shortage of well-paying jobs right alongside a streak of laziness and tendency to blame the government for what ails them. With the shrinkage of the white American majority and the changing demographic of the America they knew, he portrays a people whose religion is patriotism. But the America they once knew and loved seems to be slipping through their fingers. I wish I could say I came away from this book with a new ability to relate to this piece of the American patchwork; I must say it left me as perplexed as before. What it did do is paint a powerful picture of a people group that, like it or not, makes up a substantial portion of the US population and, as it turns out, the electorate. "Whenever times were tough— when I felt overwhelmed by the drama and the tumult of my youth— I knew that better days were ahead because I lived in a country that allowed me to make the good choices that others hadn’t." That country is in desperate need of healing right now, and if it's going to happen, we must continue to seek to understand -- perhaps through reading about real people and real experiences as in this book -- but better yet, by engaging the very people we don't understand. Ah, there's the challenge. In his book Cultural Intelligence (a phrase I happen to use quite a bit), David Livermore says the "first step toward becoming culturally intelligent is to become more aware of our own cultural identity." The last few weeks have shown me -- and us -- that we in the US don't know ourselves as well as we thought we did. It seems there were surprises at every turn during the (interminable) election season. My Friday morning breakfast buddy, David, and I would look at each other months ago and assure each other there was no way Trump would be elected. Yet here we are. The events and conversations surrounding this election, as well as other historic events such as Black Lives Matter, have had a way of revealing -- not creating -- some real gaps in understanding the Other, whoever that may be. Like a personal trial uncovers traits in us we may not have even been aware of, the same thing seems to be happening on a national scale. One not-so-attractive trait I've discovered in myself is a tendency to paint people with too broad a brush. The truth is not all Trump voters are the same or voted for him for the same reasons, and the very same can be said of Clinton supporters. And all of these people are so much more than Trump or Clinton supporters. One of the toxic byproducts of this election cycle is the tendency to divide the country into those two camps -- as if we had no other way to define ourselves. So I took David Brooks' advice and read, with my wife, J.D. Vance's book Hillbilly Elegy, which I will review in a forthcoming post. Suffice it to say for now that it is a poignant and in some ways tragic depiction of a demographic that I am still trying to understand. (Do not understand me to imply that all Trump supporters are hillbillies; if you do, you're missing the point here.) I have to confess that I often feel I relate better to people from any number of foreign countries than I do to this subculture in which Vance grew up in Eastern Kentucky and Western Ohio and unapologetically calls "hillbilly". Livermore reminds us that self-awareness is the starting place. Once we become more aware of what drives our own assumptions and values, we can begin to contrast these with those of the Other. And if you're anything like me -- and I know I am -- you have more than one Other to seek to understand. I suppose Socrates had it right when he said, "Above all, know thyself." Probably the best way to "Love thy Other." It seems each time my wife and I take a group to Europe, even though we visit many of the same places each time, there's always some new surprise that awaits us. Earlier this month, World to the Wise partnered with Journey Arts Collective to take 12 creatives to visit some of the world's greatest art, as well as meet local creatives and take time to reflect on their observations. After five full and rich days in Paris, we boarded the TGV (high speed train) for Lausanne, Switzerland, where we barely spent twenty-four hours before heading to Tuscany. Two special events were waiting for us: an evening with over 50 creatives from French-speaking Switzerland, including many old friends of mine from the six years I lived there; and the next morning, a private tour of the 800-year-old Lausanne cathedral. A historian acquaintance of mine in Lausanne arranged this treat with the docent of the cathedral, a welcoming woman named Myriam. 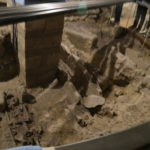 Twelve of us spent the next hour and a half in wonder as we were led first through the underground remains of the Romanesque church that originally occupied the site -- an area closed to the public. Myriam then led us around the nooks and crannies of the main level, and we ended up in the upper levels overlooking the nave, up close to the massive, world class organ. Imagine you are a master craftsman such as a stone mason or a sculptor. You spend your entire career working on by far the most grandiose structure your city has seen or ever will see. And yet you are fully aware that you will never see the finished fruit of your labors. This cathedral took 105 years to build in all its stages. 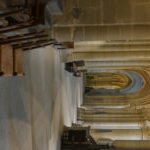 I've visited many cathedrals in my travels, but never I have I been given the gift of winding through corridors, up ancient staircases and ducking under beams where relatively few people have been. It was almost like being invited by the craftsmen themselves to admire their handiwork up close -- 800 years after they labored to produce it. What happens when you put 15 creatives in the same plane, train, bus, or automobile for almost two weeks, where they are not just sightseeing but being asked to reflect, observe, and create? My wife Becky and I have just finished conducting the first ever tour where our company, World to the Wise, partnered with the Journey Arts Collective, led by Brett Mabury. A professional musician, composer and arranger, Brett also serves as a mentor of other artists to accompany them on their…well, journey. Journey Arts Collective seeks to gather creatives into a community – not unlike some of the creative communities in days gone by (the Lost Generation comes to mind), helping them counter isolation and spurring each other toward artistic and spiritual growth. A mutual friend introduced Brett and me a couple of years ago, and I learned that Brett had wanted to take artists to Europe for years. When he heard of the World to the Wise cultural tours Becky and I have been leading since 2010, Brett wondered if it might be a good fit to partner with us on what could potentially be the first of several such adventures. 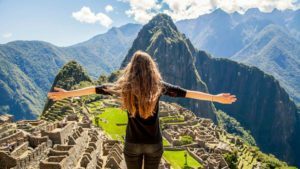 One of the challenges of taking any group to some of the world’s most interesting places is planning the time in such a way that people take in a full palette of sights and experiences without becoming completely overwhelmed and exhausted. Jet lag is not our friend in this regard. So even though we didn’t packed in as much as we might normally on one of our World to the Wise tours, the time with JAC has been exhausting but exhilarating. Brett’s intentionality about making this trip a pilgrimage and not just a sightseeing tour made every stop that much more meaningful. He had prepared a booklet for each participant containing exercises and reflections to be done at strategic points throughout each day. From Sacré Coeur cathedral to Notre Dame, from Monet’s house and gardens in Giverny to the Musée d’Orsay, each artist was enriched and challenged in his or her creative and meditative life while marveling at the amazing sights and sounds of Paris. My long-time friend Jim Beise was also on the trip, doing what he has done for over 15 years: mentoring creatives. 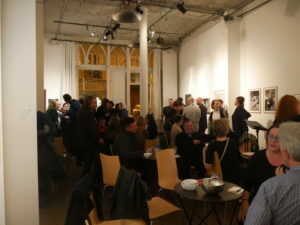 His nine years of experience and contacts in Paris made our time there that much more meaningful, as he arranged a number of get-togethers where our group was able to interact with local creative – which in Paris means a number of internationals as well, not just Parisians. Coming soon – Part 2, where we are invited on a private tour of a 750-year-old cathedral to see things that are never open to the public! I find it more than a little strange that there seems to be so little press coverage -- or interest -- in what is happening among our neighbors to the south. If Secretary of State John Kerry hadn't been in attendance, chances are the signing of a momentous peace accord in Colombia would have gone even more unnoticed. The fact is this has been the longest armed conflict in the history of the Western Hemisphere, and even a tentative end to it is a big deal. This war has killed over a quarter of a million people in its decades-long history. It began as a ten-year period called La Violencia, sparked by the assassination of a populist leader named Jorge Eliécer Gaitán. The conflict eventually evolved into one primarily over communism, with leftist guerrillas forming the FARC (Revolutionary Armed Forces of Colombia) against the anti-communist, American-backed government. Some conflicts go on for so long that one generation hands the torch to the next, and eventually no one is sure why they're fighting any more. They just know they are against the enemy, whoever that is. Many FARC soldiers were basically born into the guerrilla army, and fighting against the government is all they've ever known. Reforming these soldiers on the one hand and reforming the government on the other makes for a challenging road ahead. Yes to peace. May it be. I'm reading David Livermore's excellent book, Cultural Intelligence, where he encourages the reader to develop his or her "CQ" (culture quotient) "to engage our multicultural world". You may have heard me refer to Livermore before, and you certainly will again. My wife and I are developing and co-teaching a brand new high school course called Global Studies, and David Livermore is an invaluable resource. I relate to Livermore in so many ways. He has obviously spent a good amount of time overseas and is passionate about understanding other cultures. He rightly points out that part of the journey to cultural intelligence is understanding one's own culture better. And as we get to know ourselves better, collectively speaking, we'll be less likely to project our own cultural values on others. (Enter Socrates' "Know thyself" on a collective level.) I also relate to Livermore's experience of at times feeling great pride in his American nationality, and at other times great shame and embarrassment. Wisdom, of course, lies in avoiding both extremes (again!). The truth is, "there are aspects of American culture we should embrace...aspects we should protest and redeem...and many aspects that are simply different from how other cultures live, neither expressly good nor expressly bad." So what does it mean to be patriotic? Does it mean to trumpet your country's greatness and pretend all the flaws are not there? Is it possible to be patriotic and admit at the same time that your country has a lot to learn, and even a lot to be ashamed of? With all the talk of making America great again vs. keeping America great, so many Americans are preoccupied with the question: Is America indeed the greatest country in the world? -- as if they're afraid of losing their place in some cosmic hall of fame or being knocked off some enviable pedestal by another contender. I'm reminded of the incredibly poignant opening scene of the HBO series "The Newsroom" (sensitive ears beware), where news anchor Will McAvoy lists lots of areas where America is NOT the greatest country in the world: 7th in literacy, 27th in math, 22nd in science, etc. A big collective ouch -- not to mention the shock factor of this respected news anchor actually speaking his own mind. But what if we just set aside the whole question of whether the US is the greatest -- whatever that means -- and asked instead what would make her greater? What if we spent less time on rhetoric and more time on substance? On righting wrongs that we're already aware of? On being open to be shown our blind spots and then doing something about them? Seems to me that might be the most patriotic thing we could possibly do. "There's a whole world out there..."
A couple of weeks ago I was interviewing a dear Indian-American couple named Pravin and Fiona. They have been living in the US for a number of years, have two sons born here, and are themselves on the path toward US citizenship. (You can find that interview here.) One simple thing that struck me is something Fiona said in response to my question of what took her some getting used to about life in these United States. She said something to the effect of "Sometimes Americans don't seem to know that there's a whole world out there." I suppose on one hand our navel-gazing is understandable -- there is so much going on in this country, not to mention in our daily existence, that many might say they just don't have time to learn about the world out there. And I get it. Plus, our country is so vast, with so many beautiful places to see, one could spend a lifetime just traveling within the United States. ...well, then, you're probably not reading this blog! Because this is the place where we have turned up our curiosity, where we believe the world has more to teach us than we can contain, and where we KNOW we are richer for every single thing we learn and experience from the OTHER -- whoever and wherever he or she may be. Did you catch my interview with Navajo Nation member Dale Tsosie (pron. 'sosie') last week? He had some powerful things to say about his identity as a Native American, and how reading the Bible is what gave him permission to fully embrace his Navajo identity. In this week's podcast I have the pleasure of introducing you to a wonderful lady named Sarah Lanier, whose book, Foreign to Familiar, is a fascinating and readable look into how different people behave based on the climate of the culture they live in -- hot or cold. You won't want to miss this! I've been reminded so often of the 70's Dave Mason song called "We Just Disagree". In an already polarized culture, most of us are tempted to think in terms of good guys and bad guys. Another terrorist attack -- that's clearly a bad guy. Which, of course, makes us the good guys. My favorite candidate is the good guy, which of course makes the other candidate the bad guy. Just yesterday I was talking with some friends who were grappling with the whole situation in Turkey, where certain elements in the military attempted to overthrow the government of President Recep Tayyip Erdogan. How are we distant onlookers supposed to process events like this? Again, we often default to the question of who are the good guys and who are the bad guys? If only life were that simple. Understand, I am of course in no way condoning or excusing terrorist attacks just because "we're all human." But life is sticky. And more importantly, we are all capable of the very best and the very worst of human nature. Take the Syrian war, for example. Now put yourself in the place of the US administration and Departments of State and Defense and try to imagine choosing sides. Do you support the rebels fighting against the tyrant, only to discover that they too are beheading children? But back to our polarized culture. It turns out we're not the only ones. Brexit has not caused but revealed a deeply divided Britain, as the coup attempt in Turkey revealed the same. The us against them mentality only serves to perpetuate this polarization, and, as usual, the voices in the middle are often the faintest. For me, it comes down to the fact that I am responsible for me, and the way I view those unlike me. And if I do a little appropriate self-examination, I quickly realize all the evil in the world is not out there somewhere.